then I backspaced for a minute or ten and responded like a civilized emailer with a cordial ... "yes, please." I can't wait to see all your finery. It's freezing cold and windy here and I'm REALLY fighting the urge to wear something warm and black but I'm not big on blasphemy so I'll find something warm and pastel. Awesome! 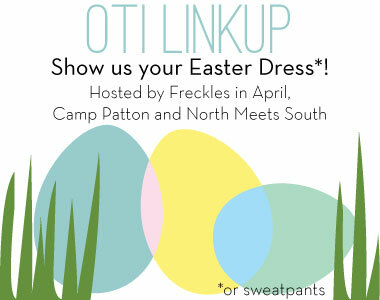 When I was picking out a dress for Easter in the back of my head I kept thinking "Grace better have an Easter link-up or what is the point of buying something new." Actually, I had to buy something new because I am 36 weeks and HUGE. Seriously, I think the ultrasound lied and there are twins in there. Totally just did a big chuckle with your "because Easter falls on a Sunday this year " comment because I actually had to pause before deciding that yes, Easter does in fact always fall on a Sunday. :) Can't wait!